Having visitors from out of province, never mind bright young engaged members of the national Engineers Without Borders (EWB) group, was a real treat and a great way to show-off the changes at McMaster's parking lot "M". The EWB crew arrived by city bus at McMaster and were met by Reyna Matties (McMaster biology) and Randy Kay (Restore Cootes/OPIRG McMaster). Hamilton is playing host this weekend to an annual national EWB conference, and the tour of Lot M was one of the field trip options. Reyna and I were very happy with the turnout! The group had about an hour, so we did a truncated version of our usual tour. It was cold but we ended up spending the entire time outside, resulting in a few cold toes by the end. 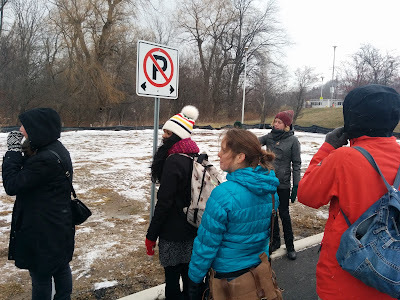 We walked the length of "Maria's Walk", the last mostly-intact trail from the Royal Botanical Gardens' 1958-1963 "Coldspring Valley Nature Sanctuary" - which by 1970 had been converted into a massive McMaster asphalt parking lot. 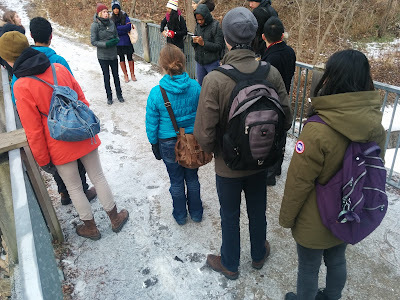 We stopped to check out Ancaster Creek and the recently created 30 metre naturalized buffer zone between the creek and the remaining parking, and we fielded lots of intelligent questions from the EWB members who shared our concern for the well-being of natural lands. We ended up having time to stop by the pioneer cemetery to end the tour with a bit of 19th Century history exploring the relationship to the land that existed before white settlers arrived in the region, who of course ended up taking land from and eventually displacing the original inhabitants of the region. 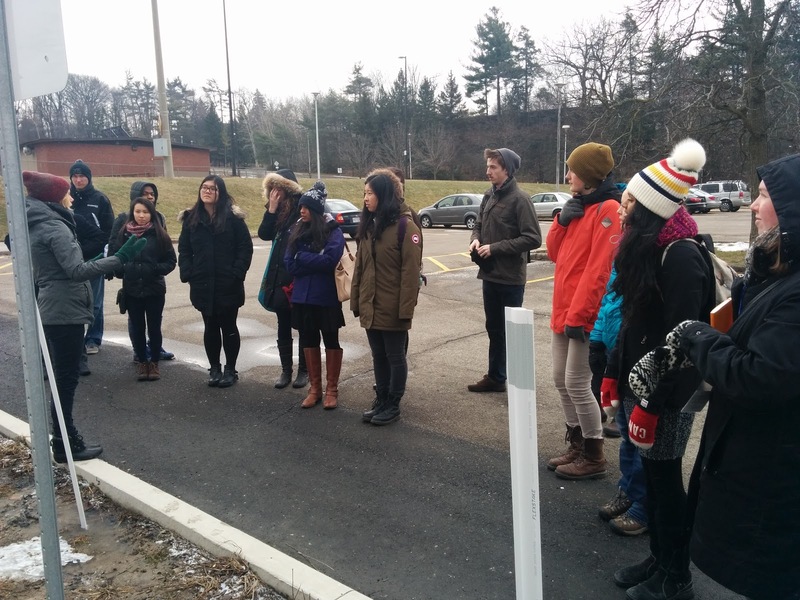 We hope the tour was worthwhile to the EWB group; we certainly appreciated their interest and bravery facing the cold weather (some in thin souled shoes! ).